Разстояние до летището 53,8 км. Имате въпрос към Wilsons Retreat? Удобно проектиран като за бизнесмени така и за почиващи туристи, Wilsons Retreat е идеално разположен в Джили Трауанган - една от най-посещаваните части на града. Оттук гостите имат лесен достъп до всичко, което този оживен град може да предложи. С удобното си местоположение хотелът предлага лесен достъп до всички градски забележителности, които задължително трябва да се видят. Wilsons Retreat разполага с 10 стаи, които са обзаведени с вкус. Много от тях предлагат удобства като телевизор с плосък екран, частен басейн, безжичен интернет достъп (безплатен), стаи за непушачи, климатик. Пълният списък от съоръжения за отдих е достъпен в хотела и включва частен плаж, голф игрище (в радиус от 3 км), открит басейн, гмуркане, риболов. С перфектното си местоположение и несравними удобства, Wilsons Retreat е един чудесен избор в много отношения. Один из лучших отелей на Травангане. Бунгало большие и удобные. Комфортные кровати для сна. Зона душа под открытым небом. Красивая территория. Вкусная кухня под руководством французского шефа - отличного парня! Обязательно попробуйте наваррскую баранину, местный бургер и стейк - они здесь идеальные. Отель стоит прямо на северном пляже в котором до наступления отлива (до 2-3 часов дня) можно отлично покупаться и снорклить. Отличные позитивные ребята - стафф. Особенно запомнилась Розитта - ходячий позитив и непосредственность. Очень красивый и уютный отель. Огромный плюс в том, что находится далеко от шумной части города, поэтому, нет толп туристов и ночью очень тихо. Пляж прямо у входа в отель. Чистые номера, очень вкусная еда в ресторане при гостинице, персонал очень добрый и внимательный, иногда даже слишком) Все услуги которые могут быть на острове у нас были. Снорклинг, дайвинг) Предложили нам с супругой организовать красивый ужин в качестве комплимента от отеля, но мы отказалась) Было приятно) Ребята все очень отзывчивые, в частности хочется отметить их главного администратора Yudha, очень благодарны ему за все! Отличная работа, сервис, отзывчивость, сразу понимал, что мы хотим) Уехали с мыслями о том, что 90% успешности нашего отдыха на Гили у нас благодаря отелю Wilsons) Из минусов могу назвать только один, который, к сожаление, присущ почти всем отелям на Гили) Не чистят береговую линию. Сам вход с пляжа в море засыпан кораллами, тяжело заходить в воду. Было бы прекрасно, если бы у территории отеля эту зону расчищали. В остальном, 5 из 5! Очень рекомендуем!!!! It was really a great place to stay at this island. Very privacy place with good ambience. Nice breakfast served by the beach. The staffs were so friendly. the things that should be done better maybe the pool water cleanliness. not that clear but still clean. Staff were amazing. Little frogs live among the pebbles in the bathroom. Had to pay for the bicycles but don't know if this is the norm for the pricier hotels in Gili T or not. Pool needs a major upgrade - mold showing on the feet of the sunbeds and between tiles. Tiles in pool also loose and broken and cut me on my knee. 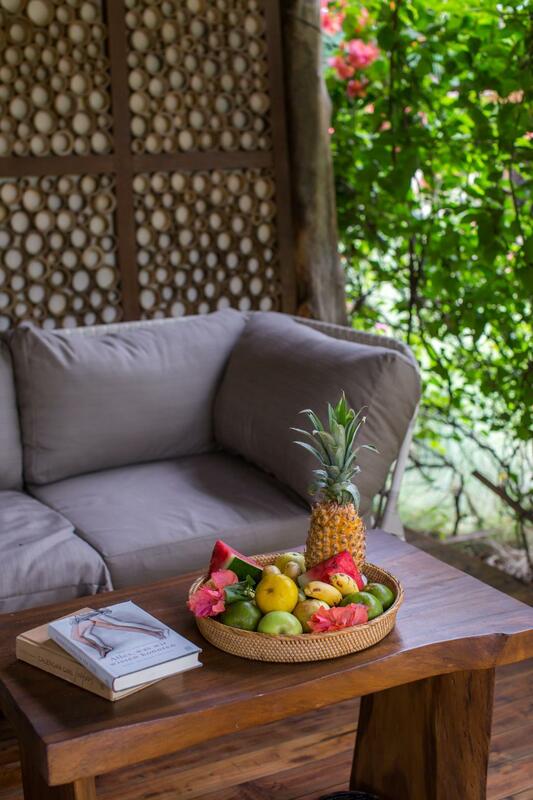 Location is sublime, quiet nights and calm days. Very few people actually make it this far away from the harbour and it was nice getting away from the noise. Nice snorkeling spot off the beach but go only during high tides because there are many sharp corals and rocks on the seabed during low tide and you will have trouble walking out to sea. Again, staff were very good. Отседнахме 9 вечер/и в април 2017 г.
still great staff and good food. AC in high season was a bit weak in the one bedroom pool villa, so it got a bit hot. sadly also the coral in the gilis seems to have been hit hard by climate change. it was brilliant a couple of years back - lots of coral bleaching now. Traveling for holiday we loved Wilsons, especially the friendly staff that made us feel at home! 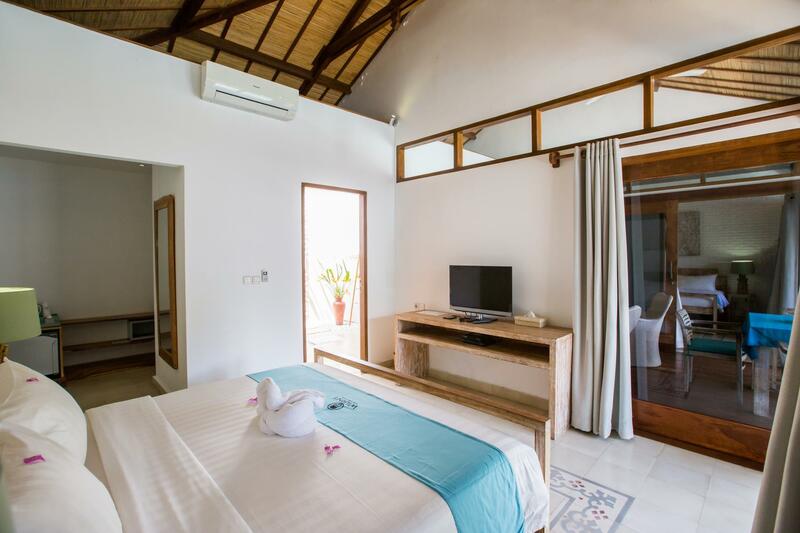 For us the location was fine - quite far away from the center of action on Gili T, however, if you are looking for proximity to restaurants and dive centers Wilsons is a bit of a walk or bike ride. Definitely definitely would come back! We loved everything about our stay at Wilson's Retreat. The location is a bit far from the center of town (15 minute by bike, 30 minute walking) but this didn't bother us as the walk is nice and bike riding around the island is great! Being away from the center of town is also a plus as it is much quieter and better for relaxing. Wilson's has everything you need - beach front, great restaurant, pool, and very beautiful/serene grounds. The best part of all was the staff - they went out of their way to make us feel at home! Finally, we especially enjoyed our meal companion "Malang" a very sweet cat that stays around Wilson's and is always up for a morsel of something :) :) If you are a cat lover like we are you must also visit "Cat's of Gilis" a local charity set up to help the island cats. Great place, would definitely go back! This place is so nice. The food and staff is great. We just love the signature wilson's steak and burger that we ate it almost everyday. The french fries is also nice for lite afternoon snack since it was freshly made. The room is perfect, especially the one with the private pool. They're just generous with space, u have lounge everywhere, inside, outside. Perfect place to spend lazy time reading or sleeping. The beach is also nice to lay around all day. And this place is so quiet since u're totally far away from the hustle n bustle of the gili trawangan crowds and night life. Stay here if u want to refresh and get a temporary peace of mind. Love the ambiance and the coziness of the place. The only thing to improve is the food, the local food and breakfast were tasteless, we were not inspired to dine at the hotel and chose to find other options. This is my 2nd time back to Wilson's. A quiet, clean and lovely Place to stay. 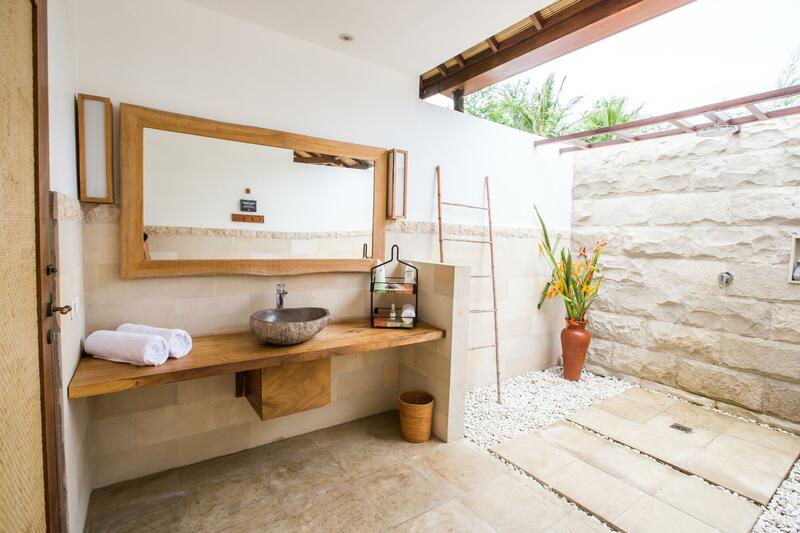 We booked a Private Pool Villa this time with very nice welcome decoration by them.Love the outdoor bathroom as you can enjoy the sun while taking a shower,and they have prepared natural mosquito repellent. The beach is beautiful and clean up every day. All the staff are very friendly, the breakfast was awesome as you can enjoy your breakfast/lunch/dinner by the beach.We spend a birthday night there(My hubby's birthday) they have prepared a surprise birthday cake during our dinner on the beach and also deco the dinning place for us.Heart Melted :) You can rent the bike in the resort. Movies can be borrowed and watch in our room. Snorkeling Kits and Kayaks are free to lend as well. Good spot to swim with the turtles ! Our stay was perfect, i am starting to miss this place now and we will definally be back soon! Wilson’s retreat located in the northern side of Gili T. It is quiet at night and you can stay away from those nightlife noise and daytime religion songs. The breakfast was simple but great. Coffee is great too. 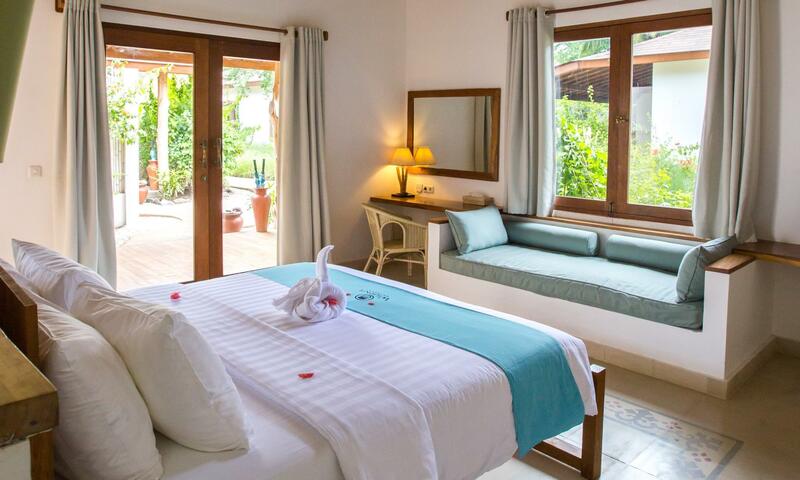 If you are looking for a hotel with reasonable price, wilson’s Retreat is your choice. Very classy layout and furnishings with large guest rooms. Staff friendly and helpful but not intrusive. Decent restaurant with French angle to menu and many Indo dishes. Beachfront north on govt protected reef (no boats allowed)! Away from the madness & dross of main part of town. Generous shampoo for your bathroom amenities but BYO conditioner and lotion. Free flow filtered water. Aimed at more sedate guests but families seem to enjoy it. Party zone is elsewhere. Can rent bikes here. 6 minute ride to Turtle Point or just snorkel out front. Wilson's Retreat is just wonderful. It's a bit of a way from the port and I did get a horse and cart, not very happily, as I worry about the horses. But it was only me and one case so I figured that I wouldn't be stressing the horse terribly. It is too far away from the port to walk. Reception on arrival was lovely. My room was absolutely beautiful. The outside bathroom gorgeous. SItting in a cabana by the pool was so so relaxing. So comfortable. Breakfast was good, sitting by the beach was also very relaxing. I went for a walk to get my bearings and was happy to come back to Wilson's and pop back on the pool lounge ! I stayed in a Muri room, not sure what the difference is between the options but Muri was perfect. It's not surprising that Wilsons is rated as highly as it is. I highly recommend Wilson's Retreat. I had such a lovely time and will definitely go back. booked a week here and wished we stayed longer. breakfast was served whenever you wanted, by the beach or in the restaurant. the private pool villa was lovely. just the amenities could have been a bit more. resort is well maintained. we really loved the staff, special thanks to abby and nina. perfect representatives. location is quiet and if you are looking for the hustle and bustle gili T is known for you will need a bicycle to get down south (appr. 20 minutes). We are definitely returning!